Former Punjab Chief Minister and Congress Deputy Leader Capt Amarinder Singh today challenged the Indian National Lok Dal and the Bhartiya Janata Party to name their CM candidates if they really had any. “Bhupinder Singh Hooda is and will be our Chief Minister, you name who is going to be your Chief Ministerial candidate”, Capt Amarinder said while addressing an impressive public meeting in support of the party candidate Dr KV Singh here today.He later addressed public meetings at Rania in support of the party candidate Ranjeet Singh and at Ratia in support of Jarnail Singh.Appealing to people to vote for the Congress he said, Mr Hooda has proved himself as a man of development during the last ten years. “He deserves a chance as much as you deserve him to be your CM for another term to serve you once more”, he said, while referring to the massive development Haryana saw under his (Hooda’s) rule. He asked people to compare Mr Hooda’s rule with that of Chautala before that. “I think I don’t need to say much as you can make out for yourself”, he remarked, while referring to the reputation Chautala carries about governance.Warning the people from opportunist leaders like the Punjab Chief Minister Parkash Singh Badal and Om Prakash Chautala, he said, while all over India Badal claimed to be supporting the BJP, here he was opposing them just for some personal interests. “This is just an example of their opportunism as they can stoop to any level where they see their personal benefit at the cost of the state”, he said, while remarking, “this is a classic case of putting the personal interest above the state and party interests”. 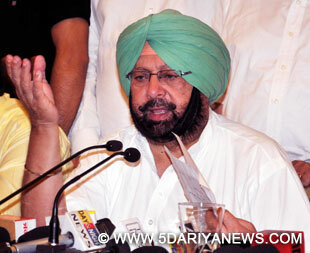 Capt Amarinder revealed as how the Badals had devastated Punjab by promoting the drug trade. “An entire generation of our youngsters has been devastated by the drugs supplied by the Badals there and I am sure they must be in search of more markets like Haryana and that is the reason that they are aligning with Chautala to extend and expand their drug business in this state”, he warned.